It’s 1977, and Carol Williams is in a lab with Gary Powers, discussing the results from one of her first chemical engineering lab experiments. The numbers don’t make sense, and Williams has come to Powers, a popular professor in Carnegie Mellon University’s Chem-E department, to figure out what went wrong. After determining that an inaccurate meter may be at fault, the two rig an experiment to test their hypothesis. A few students join in to set up the system, which includes a trash can to measure the water, a stopwatch to keep time, and a wrench to take apart the valve and measure flow variation. A few minutes later, as the setup nears completion, Williams, the only woman in the group, notices that she has ended up with the stopwatch, which means she will be timing and taking notes: not exactly the skills she’d hoped to master in this overtime effort. Williams is part of a minority; women make up only about 10% of the chemical engineering class she joined in 1976. In other departments within the College of Engineering, men dominate the demographics in even greater numbers. To make matters worse, she says, at least one of her 1970s professors doesn’t think women should be engineers. It makes her and some of her female peers spend precious exam time altering their handwriting to appear more “male” for his tests, hoping to ensure that their blue-book essays are judged on content, rather than cursive. Powers, though, is one of her favorite professors; she doesn’t find him ever treating women with skepticism or outright sexism. But somehow, on this day, the stopwatch ended up in her hands. “I don’t want the stopwatch,” she says emphatically. “I want to turn the valves. I want to learn how the automation system works.” After a nervous laugh from the group, Williams hands the stopwatch to a classmate, takes the wrench, and gets to work. Today, more than three decades later, her continued enthusiasm for taking the wheel (or the wrench) keeps her at the top of her field. 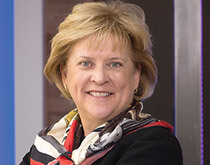 As the executive vice president of The Dow Chemical Company’s Manufacturing and Engineering, Supply Chain, and Environmental Health and Safety Operations, she isn’t just taking charge in the lab; she’s taking charge on an international scale. The Dow Chemical Company’s many products and businesses fall into four broad categories: agriculture, consumer and lifestyle, energy, and infrastructure and transportation. What that means, Williams explains, is: “If you open your refrigerator, we’re in the insulation. We’re in the paint. We’re in the plastics that are a part of it. Or your automobile: we hold the windshield in with adhesive, we are in the different panels, we’re in the seat cushions. If I look around my office, we’re in the electronics, we’re in the paints, we’re in the varnishes that are on the furniture.” Williams is responsible for overseeing the quality manufacture of each product, and for ensuring that the manufacturing processes adhere to Dow’s overarching standards of workplace safety and environmental sustainability. At the end of the day, she oversees nearly 60% of the workforce of one of the world’s biggest chemical companies. Her journey at Dow began in 1980, the same year she graduated from Carnegie Mellon with a bachelor of science degree in chemical engineering. She started her career as an engineer in research and development, taking a position in plastic films and foams at Dow’s Granville Research Center in Granville, Ohio. The job offered her a welcome change of pace from the long, sometimes isolated work of the lab, allowing her to communicate directly with customers and to apply her technical learning to real-world solutions. However, in the early years of her career, her customers weren’t always receptive to her help. When a five-foot, sweet-voiced, lipstick-sporting woman showed up to say, “I’m here to solve your technical problem,” it was “an interesting dynamic,” Williams laughs. One customer, in particular, seemed especially resistant to her suggestions, going the opposite route from any recommendation she offered. Finally, after three or four unheeded attempts to fix the customer’s problem, she had to acknowledge she was making no progress. But instead of feeling embarrassed or inadequate for being ignored, she decided to be direct about the source of the communication gap, saying, “You know, I think I need to send a man to help you.” The customer agreed. Judging from Williams’ continued excellence within Dow, the customer’s stubbornness was his loss. SHOAF ENDED UP LEAVING DOW IN 2010 AND IS NOW global director of purchasing at Styron, which produces plastic, latex, and rubber. But it hasn’t affected their friendship, and he says their closeness has given him a unique perspective on her success. As she jumped from promotion to promotion in the company, he occasionally contemplated their different paths. They had started at Dow only one day apart, and he candidly admits that the timeline invited a sense of comparison. Every promotion for Williams could have elicited the question, “Why not me?” he laughs. But he says that any initial feeling of competition quickly turned to one of admiration. Watching her adeptly tackle roles across various branches of the company, he recognized that her continual success was the result of skill, not luck. Williams’ skills have carried her through an impressive series of posts at Dow. Among them: director of the Analytical Science Lab (1993-95); business operations leader and site leader for North America Chlor-Alkali Assets (1999-2000); vice president of global purchasing (2003-04); research and development vice president for hydrocarbons and energy, chemicals and intermediates and core (2004-05); vice president of business development for market-facing businesses (2005-07); and president of chemicals and energy (2010-11). And that’s only about half the list. “I do work hard, and I work a lot,” she says. She credits much of her longevity to CMU, noting that the university instilled the problem-solving skills and interdisciplinary work ethic that opened the doors to a deep and varied career. Still, it’s hard to imagine that her climb to the top wasn’t accomplished at a frantic, or at least frazzled, pace. Just reading her résumé leaves you breathless. Yet her colleagues note that she attacks each project with a seemingly unflappable cool. “She really never loses it,” says her boss, Dow Chairman and CEO Andrew Liveris. Even working at an “omnipresent” level, “she’s always calm, she’s always collected, she’s always poised.” He remembers her strength during the early years of his leadership at Dow, when she helped lead the company’s shift toward a market-facing model. In the new model, the customer, rather than the product, would start the chain of action. So, after determining the customer’s need, Dow would work across its multiple businesses to provide a cohesive solution, rather than asking the customer to piece together an answer. Williams remembers the process as “one of the most rewarding and frustrating” of her career. Despite some setbacks along the way, she managed large-scale success on the project, including structuring Dow’s oil & gas business, with revenues now in the hundreds of millions. “I had confidence Carol could pull it off,” Liveris says, crediting Williams’ listening ability and courage under pressure as reasons for her success. Her official role on the project ended several years ago, but the trust between her and Liveris remains strong today. “I can sleep at night knowing she’s running the machine,” he says. Where today, he and his family would roast. And invite the leadership team for a barbecue and swim to stay cool. Karin Cook, a Dow operations leader in Louisiana, has a similar story to tell. Williams has been a mentor to Cook since 1996, when the two met at a Dow plant in Brazil. Williams eventually helped Cook move her career to the United States. However, one of Cook’s most exceptional memories with Williams took place far from the plant floor. It was in Baton Rouge, the night before her wedding, and she was showing her dress to her mother-in-law and Williams. Cook’s own mother, due to health problems, had been unable to travel from Brazil for the ceremony, so Cook was happy to have her “family in the States” with her. As she was showing the two women her dress, she mentioned that she wasn’t crazy about the ruffles on the bolero jacket that went with it, but that she didn’t have the time or sewing skills to change it. Williams piped up, “Well, I can sew it for you.” Cook handed off the jacket, and the next morning, the day of the ceremony, Williams returned with bolero in hand. The ruffles were gone. There’s little doubt that Marken’s description of her mom would resonate with Williams’ classmates in that sophomore-year chemical engineering lab, where she swapped the stopwatch for a wrench.? Olivia O’Connor (A’13) has been a regular contributor to this magazine since her sophomore year. This is her first feature story.